The employees at my job contribute to a charitable fund, and we donate to a different place each year. A couple of years ago we made a donation to Hospice of the Red River Valley. 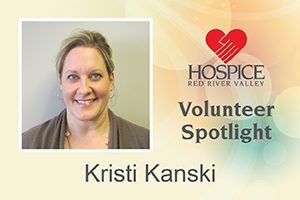 My co-worker who presented the donation had so many great things to say about Hospice after that experience. This intrigued m,e so I decided to do a little research for myself to learn more. I’m a firm believer the world needs more kindness, and I really feel the mission of Hospice aligns with my feelings of how we can each do our part to make the world a little better. I have met some pretty incredible people on this journey. They have all touched my heart in ways I never expected. I am a better person because of them. I visited a patient who was more than 40 years my senior. It felt as though she was my kindred spirit. She had the best stories, and we would both giggle like a couple of little school girls every time we saw each other. She just loved to make people laugh. We didn’t know each other long before she passed away, but a smile still appears on my face every time I think of her. I’m always in the mood for some crispy chicken wings. You name it: bone-in, boneless, hot or cold…I’m not fussy. I’m also a sucker for a good tator tot hotdish.